"I have been using iTunes movie converter on my Mac 10.11 EI Capitan perfectly for the past few years. After upgrading my Mac to 10.14 Mojave, the DRM removal tool simply doesn't work again. Is this a known bug? Is there an update pack to fix it in the near future?" "I am looking for a DRM remover to unlock all my iTunes media files such as iTunes movies, TV shows, Apple Music, audiobooks, podcasts. It seems all the tools in the market only supports up to Mac 10.12 system. Why is that?" 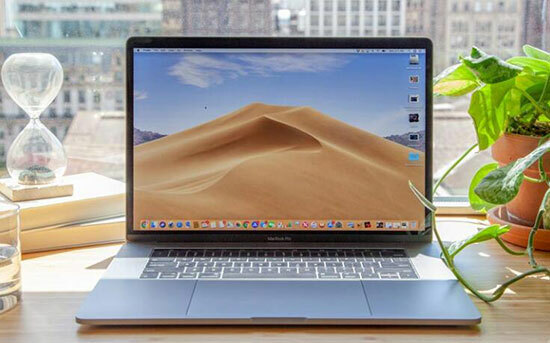 Mojave, the successor of High Sierra, is the latest desktop system for the Macintosh computers. It has a bunch of new features like dark mode, cleaner desktop, better privacy, continuity camera and more iOS Apps integration. But if you have upgraded to it, you may find some fantastic old apps may not be compatible with it anymore. One of the typical case is the DRM video converter. Here I will take a deeper look at the media converting on Mojave and offer the best alternative solutions. On the previous Mac system 10.8~10.12, there is an iTunes loophole that can be used by the third party software such as the free Requiem, Ondesoft Video Converter, TunesKit DRM Media Converter etc. to unlock the iTunes M4V files. Although many users remove DRM for personal use only, Apple doesn't allow it. To stop breaking DRM, they fix the loophole on 10.13 High Sierra and 10.14 Mojave. Now the privilege to remove iTunes video DRM on High Sierra/Mojave is totally gone. Some people may wonder about the other types of iTunes files such as Apple Music, audiobooks, podcasts and so on. Actually, Apple don't allow other third-party tools to crack DRM on the audio files either. Fortunately, for audio files, instead of using DRM removal technology, it is possible to record them legally. DRM Audio Converter for Mac developed by the DRmare is an outstanding tool. It supports background record and it can detect the audio noise and remove it directly. The trial version is free, you can give it a try to convert Apple Music to MP3 on Mac. When Mojave was first released, there is an entry for users to click to restore the system if they feel regretful after upgrading. But as Mojave has been out for a few months, the option was removed. What is even worse is that Mac OS 10.12 is not available to download on the App Store anymore. That means you can't manually downgrade 10.14 operating system. 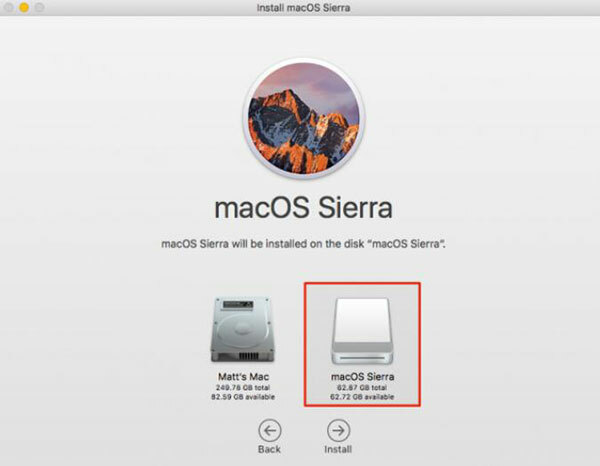 It is same that you need Mac OS 10.12 Sierra to install dual boot systems on your computer. You can't download it from App Store anymore. But you can check other Mac communities or forums to see if you can download a copy. If yes, you can follow the steps below to install 10.12 Sierra via external hard drive. In this way, it won't affect your 10.14 Mojave system. Step 1. Insert an external hard drive to your Mac computer via USB. Step 2. You can click Utilities > Disk Utility and then follow the screen wizard to format your external hard drive. Step 3. Double click the MacOS Sierra installer package, it will initialize the installation. Step 4. Choose "Agree" on the license agreement, select the destination installing device and click "Install". Step 5. It will prompt you to input your user name and password, please do as requested and wait a few minutes for it to complete installing. Note: When it is done, you will have two systems on your computer. 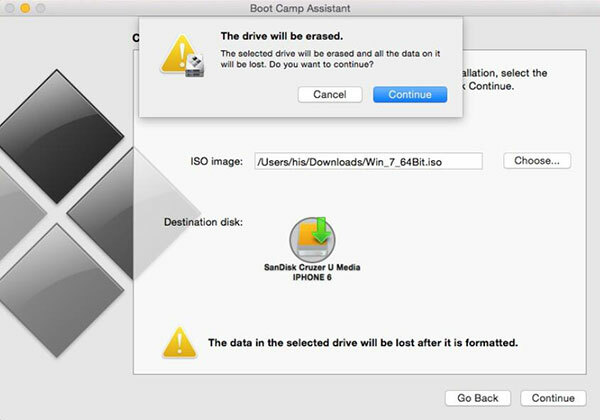 To convert iTunes digital movies, you can choose to boot into the 10.12 OSX system. On a Windows devices, it can not only get rid of DRM protection perfectly, but also runs much faster. If you find it hard set up an old Mac OSX, you should try to get an Windows PC or setup a Windows system on your Mac computer. Speaking that, there are many ways to get Windows on Mac. You can do that by using BootCamp or a virtual machine software such VMware. But what is the difference and which is better? When you are using a virtual machine VMware to install Windows system, you will get the error "The display device is not HDCP compatible" when playing iTunes movies. As a result, you can only remove DRM from iTunes SD movies instead of HD movies. If you install a standalone Windows via BootCamp, it won't has this problem at all. During starting, it will just ask you which system you want to boot from, Windows or Mac. Here we'd recommend you to use BootCamp. Step 1. Backup your data your Mac and clean the hard up to make more remaining space. Step 2. Get a Windows 10 ISO image file from the Microsoft website. It is free. Step 3. Click Applications > Utilities, find and launch BootCamp assistant and locate the Win 10 ISO file from your computer. Step 4. Your Mac computer will restart and ask you to create a partition for Windows. Just do as the screen requests. Step 5. Choose the ISO file and click "Install". Within a little while, Windows will be on your Mac computer. DRmare M4V Converter is a leading software to convert DRM videos. However, like other competitors, it doesn't work on Mac 10.13 High Sierra and 10.14 Mojave yet. But please just don't worry. If you have purchased Mac, you just need to contact the DRmare after-sales team to get a Windows PC version for free. After that you can go ahead to use it to remove DRM protection from iTunes movies quickly. 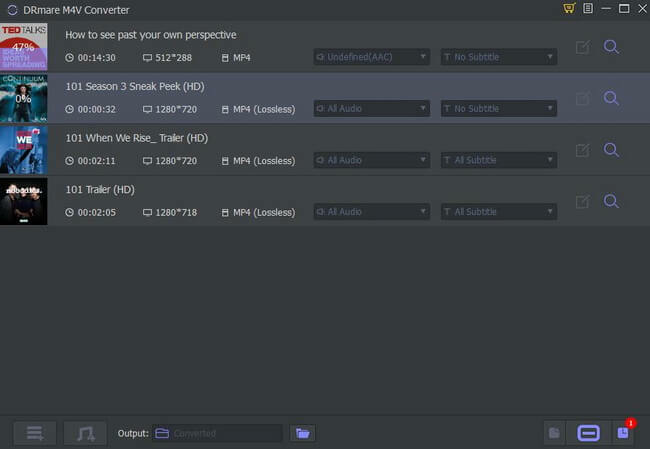 Just drag & drop to import the videos, select the output parameters and edit the subtitle, audio track and so on. At last, you can one click to convert them automatically in batch. That is it. So easy, right? Hope you enjoy iTunes movies anywhere.